Welcome! Caswell Pet Lifeline is a private animal rescue organization formed in April 2012. We are an all-volunteer run, not-for-profit organization. Our goal is to reduce the unwanted pet population by providing education and monthly, low-cost spay/neuter clinics, and by moving as many rescued (stray, abandoned, wild and feral) cats and dogs as possible into homes where they are wanted. LOW COST spay/neuter services, 3rd Monday of every month, in YANCEYVILLE arranged by Caswell Pet Lifeline. 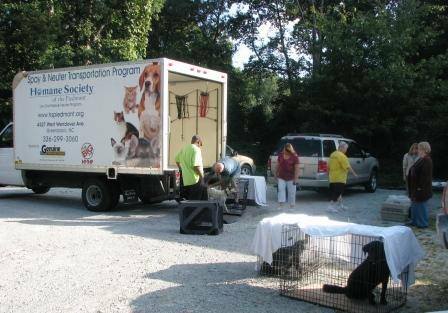 Surgical services provided by Humane Society of the Piedmont, Planned Pethood of Greensboro. NO INCOME or RESIDENCY requirements to qualify for this low fee! Cost is $65 for most dogs and $50 for cats. Dogs over 70 pounds have an extra charge. Caswell Pet Lifeline is expanding to meet the needs of Caswell County animals in need! We have expanded into cat/kitten rescue to help the county’s cats find good homes and relieve some pressure due to lack of space at the county shelter in Yanceyville (Animal Protection of Caswell County). Our first group of cats and kittens are available for adoption! All cats and kittens will be cared for in volunteer foster homes until adopted. Check us out on petfinder and watch for new additions! 100% of adoption fee goes to rescue and provide care for another county cat/kitten in need!